We’re all familiar with military dogs, but are military cats actually a thing? 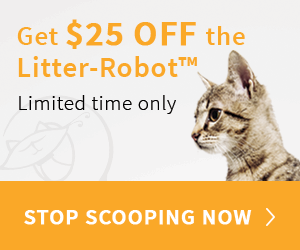 Yes – they are! “Pfc. 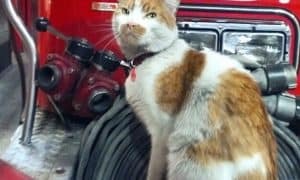 Hammer” decided to move in with the troops of a U.S. Army unit in Iraq in 2004, killing and chasing away mice that would have devoured or contaminated the soldiers’ food stores. The men were so grateful for Hammer’s hard work and affection toward them that they made him an honorary member of their unit. After their deployment, they got help from Alley Cat Allies and Military Mascots to bring him back to the states. He now lives in Colorado with his old comrade, Staff Sgt. Rick Bousfield. 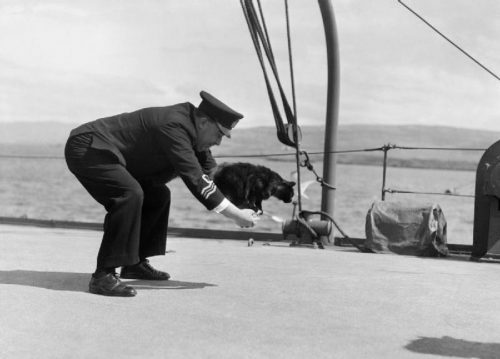 Able Seacat Simon, of the Royal Navy’s HMS Amethyst, began his career in 1948 as the Amethyst’s ratter. During the time he served, Simon performed his duties so well that he awarded twice. The first after a particularly grueling incident with Chinese forces, Simon was awarded an Amethyst campaign ribbon for his valiant service. The next was the Dickin Medal for animal gallantry. 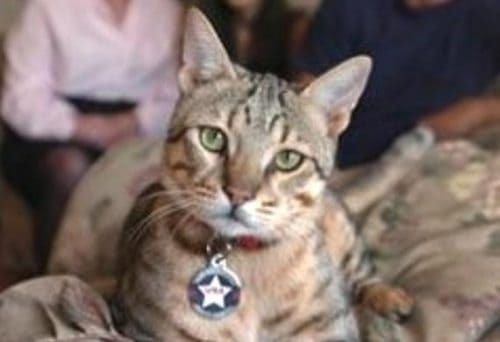 Simon is the only cat to have received the Dickin Medal, and when he died, he was buried with full naval honors. 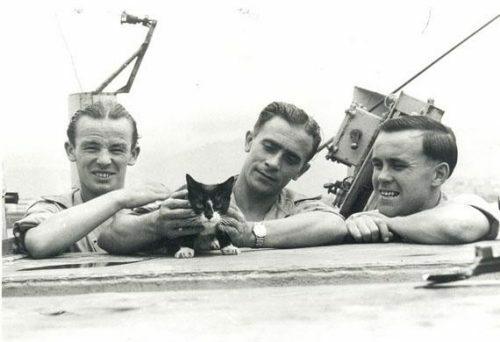 Peebles was the ship’s cat aboard HMS Western Isles. 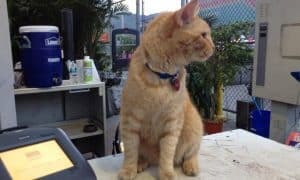 Another cat who became a favorite of the ship’s crew, he was known to be particularly intelligent and would shake the hands of strangers when they entered the wardroom. Peebles is seen above on top of the deck, participating in a game of jump through the hoop during WWII. 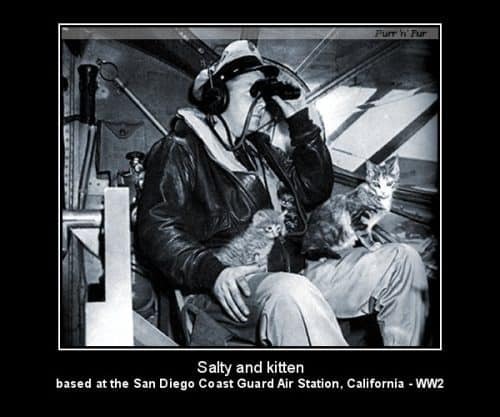 Salty was a US Coast Guard mascot and became the first cat to take part in a rescue mission when she stowed away, with her kitten, on an amphibian reconnaissance plane just before it took off to effect the rescue of a pilot who had come down at sea. She was based at the San Diego Coast Guard Air Station in California. 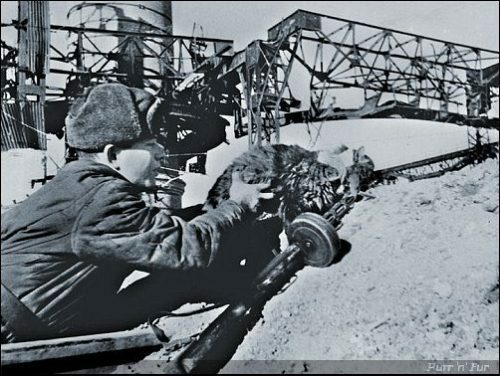 Mourka was a cat during the German siege of Stalingrad in 1942-43, who risked all nine of his lives carrying messages about German positions from a group of Russian scouts back to their headquarters. He was probably well rewarded for his efforts and devotion to duty, as there was a kitchen in the HQ building. 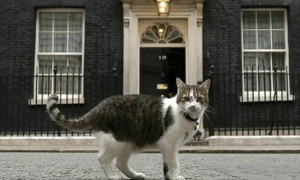 Do You Know All of these Famous Working Cats? Don’t forget the anonymous mascot of the HMAS Encounter (Royal Australian Navy), captured in this 1914 photo. Wonderful stories. Cats are such endearing creatures. A house isn’t a home unless there is a cat living there. It was nice reading this again. I remember when I first read it a few years ago in PetMd, a Heuer did it I believe. But I really enjoy reading things like this. Animals are truly amazing, they have served in peace and war. They have served man as burden bearers, as sources of food and clothing, as sanitation agents, and as helpers in the vital activities of plowing and harvesting. Their variety of form and color has delighted his eye; their habits and instincts have been and still are an extensive field for inquiry into the marvels of God’s creative work. No matter how you look at it. Animals are amazing creatures and supply us with lots of love, frustration, amusement, loyalty. Excellent examples for us in caring for us, each other, and other species. They don’t recognize color, breed, borders, ability, etc. They accept all. Live in the moment. Accept what life hands out without bitterness, resentment or anything else.